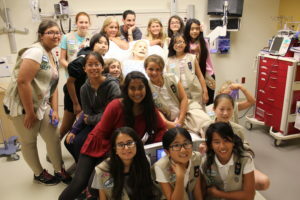 Girl Scouts learning STEM at the Kaiser Simulation Lab including emergency room scenarios. 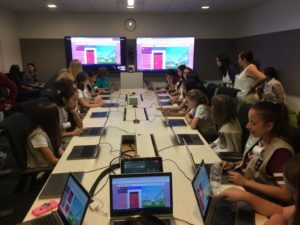 An exemplar to other Girl Scout councils across the country, Girl Scouts of Orange County began focusing on STEM in 2015 with the introduction of the My STEM Life badge for Girl Scout Cadettes through their vibrant partnership with local companies such as Broadcom, Western Digital, and Cox Communications, to name a few. Called the Girl Scouts of Orange County STEM Consortium, these leading STEM companies wanted to debunk the myth that boys are “better” in these subjects and pave the way for young women in Orange County to get excited about and stick to STEM subjects in school. Together with the STEMsational ME! badge for Girl Scout Juniors, almost 3,000 Girl Scouts have now earned one of Girl Scouts of Orange County’s STEM badges; a staggering amount of young women who have gained insight into how STEM impacts their lives and especially the community they live in. Serena, a 6th grade Girl Scout Cadette from Troop 3385 in Irvine, visited Google where she designed her own emoji (a happy face with glasses if you were wondering). Then, she made her own Gif (a unicorn dancing under a disco ball) where she learned coding. “I would love to work at Google; coding was really fun, especially when we worked together in groups and were able to be more creative. I like it better than just listening,” said Serena. Google Fiber hosted 15 Girl Scout Cadettes who coded using MadewithCode.org, watched a video on programming special effects in the Wonder Woman movie, and then toured Google offices. Girl Scouts of Orange County was sure on to something! Following suit, the national organization Girl Scouts of the USA recently released 30 new STEM and outdoor badges available to girls across the country in K-12 grade with topics that include Robotics, Mechanical Engineering and Space Science. Broadcom Foundation’s “We Salute” series profiles noteworthy partners that are changing the game in STEM education.